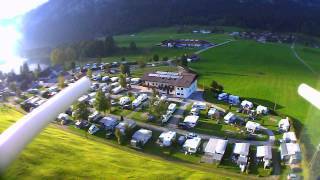 Camping Seehof is a family run site and excellent in every respect. 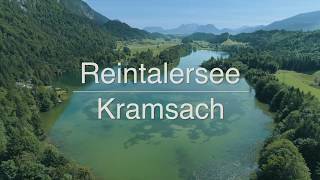 It is situated in a marvellous sunny and peaceful location on the eastern shores of the Reintalersee. The site’s comfortable restaurant has a terrace with lake and mountain views and serves local dishes as well as homemade cakes and ice cream. The site is in two areas: a small one next to the lake is ideal for sunbathing, the other larger one adjoins the excellent sanitary block. There are 170 pitches, 140 of which are for touring (20 tent pitches), served by good access roads and with 16A electricity (Europlug) and TV points; 100 pitches are fully serviced, with more being upgraded every year. Seehof provides an ideal starting point for walking, cycling and riding (with a riding stable nearby) and skiing in winter. The Alpbachtal Seenland card is available without cost at reception and allows free bus transport and free daily entry to many worthwhile attractions in the region. With easy access from the A12 autobahn, the site is also a useful overnight stop. Bread is available each morning from 07.00 without pre-ordering. An extensive lakeside playground has just been added. The sanitary facilities are first class and include ten bathrooms to rent for private use. Baby room. Facilities for disabled visitors. Dog shower. Washing machine and dryer. Ski room. Motorhome services. Small shop. Good value restaurant. Playground. Bicycle hire. Fishing. WiFi over site (charged). Apartments to rent. Renovated fitness and play rooms. From A12 take Kramsach exit and follow signs for Zu den Seen past Camping Krummsee and Stadlerhof along northern shore of lake, then right at crossroads. All clearly signed. Camping Seehof (300 m) is the first campsite you reach. New driveway and reception on the left.